Best and Reserve of the seven bantam classes with a minimum of 25. Star pins will be awarded to all wins in classes of 100 or more. All wins in Classes of 100 or more will be denoted with a star * and be retained in the ABA records to accumulate towards the Master Exhibitor, Master Breeder, and Lifetime Achievement awards. Only ABA members are eligible to compete for the above awards. Dues are $20.00 per year $50.00 for three years. 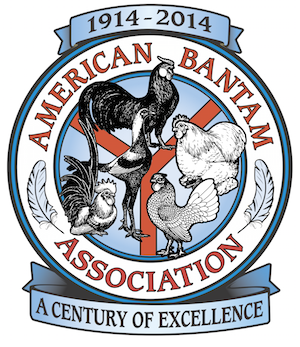 New members receive a copy of the quarterly and the latest available copy of the Annual American Bantam Association Year Book which lists many advertisers and includes a complete breed and variety index. Winners of ABA awards are listed in the year book under Who's Who in Bantams. Champions and Reserve Champions in the seven bantam divisions. Best and Reserve of Breed and Variety. Best and Reserve Display when 10 or more bantam displays are shown. Best and Reserve Trio when 30 or more trios are shown by 4 or more exhibitors. *****Awards are subject to change.